A big thank you to our talented volunteer musicians who provide entertainment for our shoppers starting at 5:00 each week. 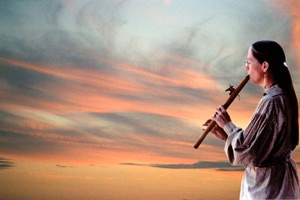 This week, Sunflower will envelop us in the warm and soothing sounds of handmade native flutes. Janice Trytten’s music truly transports listeners to another place and time. Pick up a pulled pork sandwich or veggie cobbler from Aunt Flora’s to eat while you listen, and there you have it: dinner and entertainment for your Thursday evening! The weather should be perfect for hanging out, enjoying the music, the food, and the company of neighbors. The rains this summer have produced some bountiful harvests. All this summer produce will be there for you at the market this week, from 3:00 till 6:30 at the corner of Hamilton and Llanfair, in the parking lot of the College Hill Presbyterian Church. Credit cards and EBT cards are welcome. With the Produce Perks program, EBT customers can double their dollars spent on fresh fruits and vegetables, up to $10.00. Let us show you how! This entry was posted in News and tagged Aunt Flora, Back Acres Farm, Bergefurd Farms, College Hill, College Hill Farm Market, College Hill Presbyterian Church, CSA, farmers' market, Grandola Granola, Llanfair Retirement Community, local farm, local food, North Oaks Farm, Our Harvest, Produce Perks, Sunflower, Twin Towers by College Hill Farm Market. Bookmark the permalink.